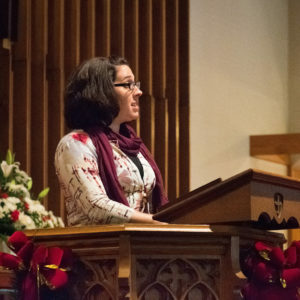 The meeting will begin with an Ecclesiastical Council to meet, review the credentials and hear the reflections of Amie McCarthy and to examine her at to her fitness to be ordained to Christian Ministry in the United Church of Christ. If the examination is successful, Amie will be approved for ordination pending a call to ministry in the United Church of Christ. A link is provided to Amie’s Ordination Paper. You are asked to download and read it in preparation for the Council. Following the Council, there will be a light meal. The Ecclesiastical Council is a gathering of delegates on behalf of an Association to decide, on behalf of the United Church of Christ, for or against the ordination of a Member in Discernment (pending the receipt of an ordainable call) following the affirmative recommendation of a Committee on Ministry. At the Committee on Ministry’s recommendation, the Association schedules an Ecclesiastical Council and shares the Member in Discernment’s ordination paper or portfolio presentation with the Association for its consideration. Delegates from Local Churches in the Association gather as an Ecclesiastical Council to examine the Member in Discernment and to vote for or against their ordination. If the outcome of the Ecclesiastical Council is No, Member in Discernment status is terminated, with or without bias, and updated in the UCC Data Hub. If the vote is Yes, the UCC Data Hub is updated to indicate that the Member in Discernment is “approved for ordination pending call.” At that time, the Member in Discernment may begin to circulate a UCC Ministerial Profile.